It's true enough to say, that a journey of 1000 miles must begin with a single step. So, what can one say about the journey that might last tens of thousands of miles? It might not necessarily be the physical action of moving one leg in front of the other. But also the various stages of actually organising and planning a journey such as this. If that part is true then I'm already a significant way into my journey, as I have been planning this trip for many years. We all have our own dreams, our own ambitions, our desires and although some of us may never ever achieve those goals or dreams we all strive to make them reality. I am not rich by any stretch of the imagination and certainly have no desire or ambition to become a millionaire, but I decided a long time ago that when I had some spare money and the time in life to do it, I would travel and see something of the world. I am now at a stage in my life where I don't have any significant commitments to anybody except myself. I'm fortunate enough to have some meagre savings which allow me to be able to try to travel the length of the Americas and to discover and wonder at a myriad different things along the way. I am fortunate enough to have good health and youth on my side. And I'm fortunate enough to have the strength and support of friends and family who are equally as enthusiastic about this journey as I am. Opportunities come about like this, just once in a lifetime. I have been wanting to do a ride like this for a very long time. 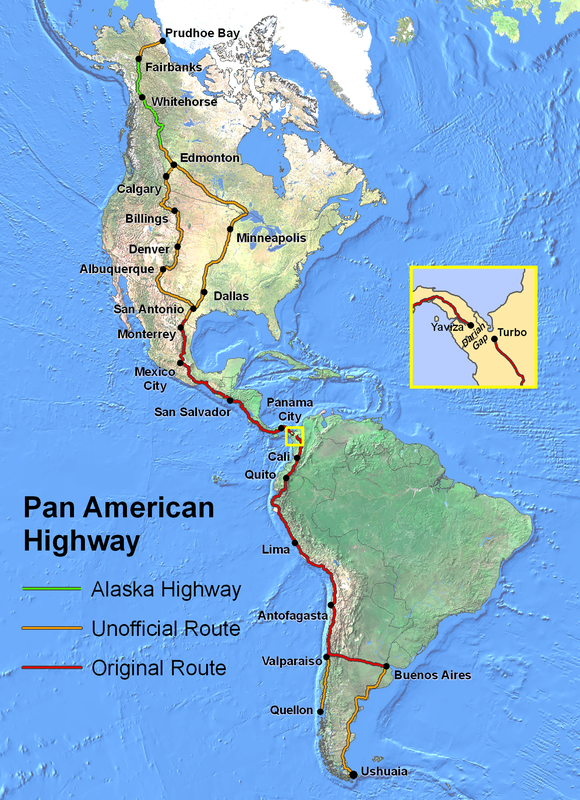 My plan, is to ride the Pan American highway. This route runs almost continuously from Prudhoe Bay on the very northern coast of Alaska to the town of Ushuaia on the southern tip of Argentina. Though for the first part I will be following the "official route", I plan on making a big detour more or less immediately to travel east across Canada through, Whitehorse, Edmonton, Saskatoon, Winnipeg heading towards Toronto. Hopefully I will enter the USA somewhere on the eastern side around Toronto and Niagara falls. Ultimately, I have no idea whether this trip will last six weeks, six months or a couple of years. One cannot predict the future. The ultimate goal would be to arrive on the southern tip of South America at some point in the future having experienced a wide variety of pleasures and pains along the way both physically and mentally and geographically. At this stage I'm only planning the first six months or so. It may be that such a journey doesn't really suit me. It maybe that my plans change and my goals become different. But for the time being my plan is to begin this ride in May 2014 landing in Anchorage, Alaska then a few days later flying north to Prudhoe Bay, Alaska and beginning the first stage of 500 mile journey back to Fairbanks Alaska. This blog is to act as a journal of my adventures for myself mainly, and for those who are interested in following. However, unlike my last blog, this will not be a daily diary, but a collection of tales from the road. It will be in a date order, but the focus will be on the experience, rather than the specifics of where I turn left or right, if it rained, and complaining about the price of bread. I also hope to be able to Video blog and upload them at regular intervals. A 1 minute video, I feel can tell more of a story than the 10 minutes of typing it has taken me to get this far. There will be text, there will certainly be plenty of photos, but I hope to have lots of little tales to tell of my personal journey of discovery through the Americas.